Total solar eclipse over Kentucky. Kentucky eclipse. Great American Eclipse. 2017 solar eclipse. Solar eclipse 2017. 2017 eclipse. 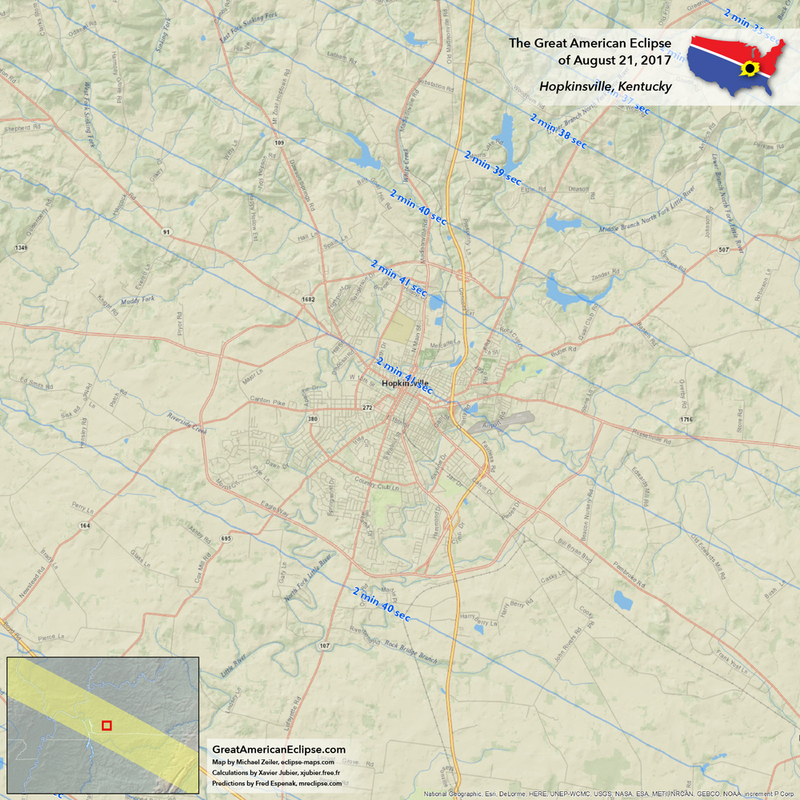 The point where the Sun, Moon, and Earth line up most perfectly during the eclipse is near Hopkinsville. This is called "the Point of Greatest Eclipse" and eclipse duration here is within 0.2 seconds of the maximum in Illinois. 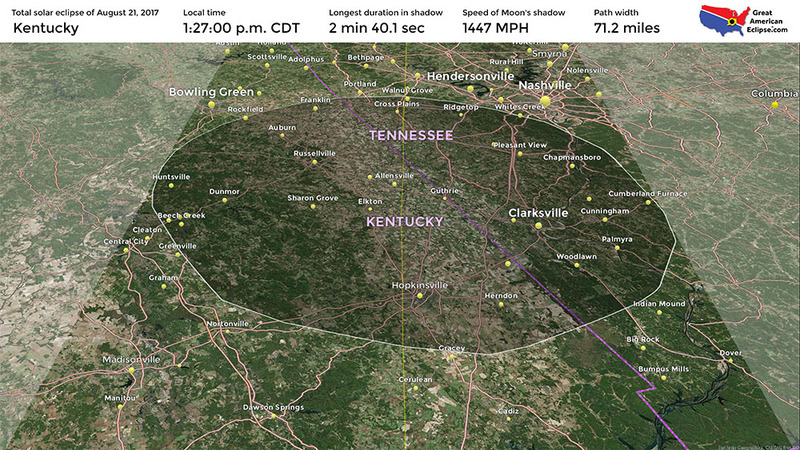 Kentucky experiences about the longest eclipse duration, just over 2 minutes and 41 seconds. The civic boosters in the Hopkinsville area are advertising this spot as the very best place in America to see the eclipse. On this very day of August 21st, the town of Hopkinsville whimsically celebrates a purported alien encounter with a Little Green Men festival, so the world of solar eclipses and alien encounters will conflate in Hopkinsville on this day. If weather permits, Hopkinsville will clearly be a favorable location, but let's be clear: there are great spots to view the eclipse across the entire path of the total solar eclipse. The weather forecast in August here is not so great, perhaps a 2 in 3 chance of clouds according to eclipse weather expert Jay Anderson on his website eclipsophile.com. Expert eclipse chasers are used to those kind of odds and have frequently beat them by study of the short term weather forecast and being prepared to drive several hundred miles to clear skies. With mobility, you can dramatically improve your odds. Don't think that reserving a hotel room here is essential. There are reports of hotel rooms already reserved at inflated prices. The truth is that you can experience over 2 minutes and 40 seconds of totality over a band several hundred miles long that includes Missouri, Illinois, Kentucky, and Tennessee. CLICK FOR THE Illinois STATE PAGE ON ECLIPSEWISE.COM. THE SITE PROVIDES THE MOST COMPREHENSIVE AND AUTHORITATIVE STATE PAGES FOR THE 2017 ECLIPSE. ECLIPSEWISE.COM IS BUILT BY FRED ESPENAK, RETIRED NASA ASTROPHYSICIST AND THE LEADING EXPERT ON ECLIPSE PREDICTIONS. Hopkinsville has one of the very longest durations at 2 minutes and 41 seconds. Paducah gets 2 minutes and 19 seconds. Bowling Green is in darkness for 1 minute and two seconds.